Spacious, highly appointed Beautiful country Villa, 5000 square metres, with distant views to Atlantic. Tree lined Courtyard, space for 10+ cars. Disabled friendly. Wetroom, Alarm wifi, BBQ, huge Terrace, deep 12 x 9 m pool. Nature lovers Paradise. Lawned gardens to pool, many fruit trees, flowers, birds, wildlife and tranquility. MINIMUM OCCUPANCY Based on 6 people x 1 week. Low occupancy discounts and long term stays negotiable. Disabled friendly throughout. Huge paved, pine tree lined private walked Courtyard. Space for over 10 cars. Many fruit trees, including Apple, Nisperro, Figs, Lemons, Vines. Nature lovers, bird lovers, astronomy lovers paradise. Huge deep pool with Roman steps and wheelchair friendly Ramps. Night lights for night swimming, outdoor shower and various height diving platforms, from pool house. Distant sea views from the pool. House well appointed throughout, very spacious. I have owned this beautiful Andalusian, spacious country property with views to the Atlantic Ocean, since 2007. 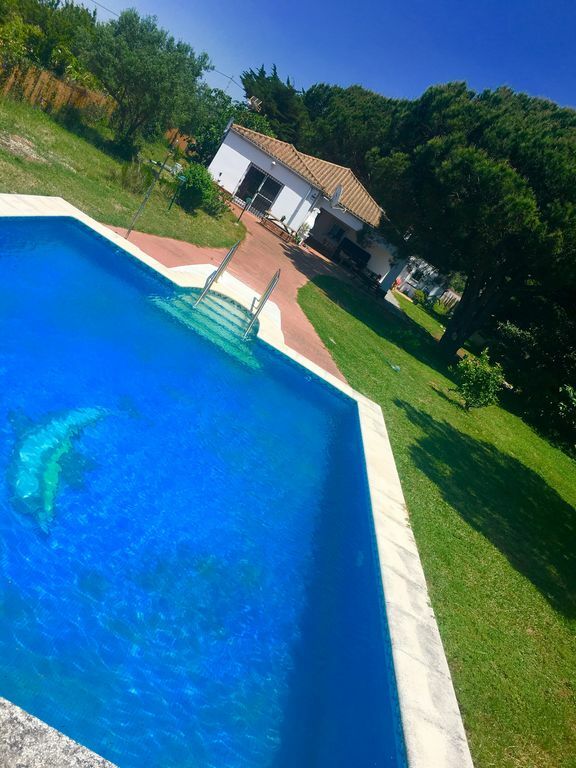 The property is much more than a typical holiday let and is highly appointed as it was my permanent home until 2015 and is only rented for approximately three months of the year in high season. I and my friends use the property often outside of the summer months (although it is always bookable for paying guests, of course.) I feel very privileged to own a truly magical property with an amazing abundance of wildlife and sunsets that truly blow your mind. If you are into nature and astronomy, even better. If not, then we are in the heart of Flamenco country and a fifteen minute drive from the stunning walled Roman City, of Cadiz. I can guarantee Guests will have a memorable holiday if they choose to book my Andalusian paradise! HIghly appointed throughout. Peaceful but ideal location for sight seeing and beach lovers. Huge paved, pine tree lined private walked Courtyard. Space for over 10 cars. Many fruit trees, including Apple, Nisperro, Figs, Lemons, Vines. Described by past guests as: stunning views, peaceful, like a "Disney garden", amazing deep pool with views of the ocean, stunning night skies. abundance of nature, flora and fauna, many resident birds and butterflies. Nature lovers, bird lovers, astronomy lovers paradise. Huge deep pool with Roman steps and wheelchair friendly Ramps. Night lights for night swimming, outdoor shower and various height diving platforms, from pool house. Distant sea views from the pool. Disabled friendly, peaceful tranquil location, nature lovers paradise. Abundance of birds and wildlife and much flora and fauna. Stunning sunsets and night skies. Huge deep pool with sea views. Highly appointed guest bathroom, very spacious spa shower, glass sink, bidet, toilet, fully tiled with high window for natural light. Please think carefully before use of precious water. Two working Chimineas. One in salon, on in Master Suite. Firewood available. Huge Courtyard. Easily park 10 cars and more. BBQ with the property’s own pine wood for fuel. Fully stocked cupboard and kitchen, including tea towels, tableware and utensils for six people. Extra available for larger parties. Large, stunning terrace with original large Bamboo Suite and plants. An outdoor living room with the most amazing views. Wheelchair accessible throughout the entire property including the pool which is ramped and then bars and Roman steps to the water. The ensuite wetroom room is wheelchair friendly. The place has a great view into the countryside. It is a huge compound with old trees and could be a really nice location, if there had not been quite a number of severe deficiencies: No warm water in our first days after arrival due to bird's nest in the paneling of the boiler which burned down the boiler when it started to heat. Obviously nobody had checked it. Soapy and leaking shower and sink in one of the bathrooms, a clogged drainage in the other which made it unusable. Partly repaired in the second week of our stay (we only had two weeks), but I had to close down the water supply for the sink to avoid a constant watering of the floor until our departure. Dirt, Cob-webs and cockroaches in the house. No working TV, no functioning fan in one of the bedrooms, TV was repaired on day 12 of our stay (out of 14), a new fan was brought in on day 10. Poor and partly not working equipment in the kitchen, the dishes and glasses were not cleaned properly when we arrived. Constantly rumbling noise in the living room on windy days due to a turning outlet of the chimney. Broken wooden table and bench on the terrace with sharp pinnacles, so danger of getting hurt when taking a seat. A lot of dirt and drunken insects on the ground and the steps of the pool. Dog excrements all over the grass, to some extent cleaned during our stay, but there were more than a dozen still there when we left. This is not the complete list of all shortcomings, but it contains the most important ones. As in our second week there were still quite a number of things not in a working order we asked the owner (living in London) for a price reduction. This unfortunately led to a number of very unpolite verbal counterattacks. In return the owner announced that she was thinking of charging us for the bedding and the towels although this was of course already included in the original contract. So far we have not even received our deposit, although we did not damage anything nor asked for any additional services and left the house in a cleaner state than when we arrived. We have never ever had any problems with the owners of the houses we rented for holiday. This seems to be the first blunder. Sad experience ! Apart from that we enjoyed our stay in Andalusia and at the Costa de la luz. Great beaches, impressive cultural heritage, nice food, good weather - we recommend to spend vacation in this part of Spain very much ! Chiclana de la Frontera is a town and municipality in southwestern Spain, in the province of Cádiz, Andalusia, near the Gulf of Cádiz. It belongs to the association of municipalities of the Bay of Cádiz (Bahía de Cádiz), the provincial capital of Cádiz, Jerez de la Frontera, San Fernando, El Puerto de Santa María, Puerto Real and Rota which form the third largest metropolitan area in Andalusia, behind Seville and Malaga, and the twelfth largest in Spain. It is located 20 kilometres (12 miles) from Cádiz, and borders the municipalities of San Fernando and Puerto Real to the north. In 1877, the municipality's population was 11,677; in 2012, it was 81,473. It has a surface area is 203 square kilometres (78 sq mi) and a population density of 401 inhabitants / km ². The average elevation is 11 metres (36 ft) above sea level. The economy depends largely upon modern industry, especially salt processing and tourism, and the municipality is known for its beaches such as the 6 kilometres (3.7 mi) long Playa de la Barrosa, hotels and golf courses in the resort of Novo Sancti Petri. The municipality contains the largest number of hotel beds in the Province of Cádiz and the Costa de la Luz. The town's newspaper, Chiclana Información, is distributed on Saturday mornings. Playa de la Barrosa is a 6 kilometres (3.7 mi) long beach in the municipality of Chiclana de la Frontera, Cadiz, Spain. It was the site of the Battle of Barrosa in 1811. it is separated from the Playa de Sancti Petri by a cliff. The resort of Novo Sancti Petri lies naast Playa de la Barrosa, which contains the Torre Bermeja. Several pieces of music have been composed about the beach including Isaac Albéniz's Torre Bermeja and Paco de Lucía's La Barrosa. Novo Sancti Petri is a resort town in the municipality of Chiclana de la Frontera in the province of Cádiz, Andalusia, southwestern Spain. It lies along the Playa de la Barrosa to the south of the main town of Chiclana. It is known for its high number of golf courses and hotels, covering an area of about 4000 hectares. The municipality contains the largest number of hotel beds in the province of Cadiz and the Costa de la Luz and has about 20 luxury hotels which are 4 or 5 star. Notable golf courses include the 36-hole Club de Golf Novo Sancti Petri, the 18-hole Club de golf Melia Sancti Petri, the 9-hole Club de Golf Campano, European Golfes Academy, Escuela de golf Practeegolf and Campo de golf Lomas de Sancti Petri. It also includes the Barceló Sancti Petri Spa Resort. The Costa de la Luz (Spanish pronunciation: [ˈkosta ðe la luθ], "Coast of Light") is a section of the Andalusian coast in Spain facing the Atlantic; it extends from Tarifa in the south, along the coasts of the Province of Cádiz and the Province of Huelva, to the mouth of the Guadiana River. A popular destination for vacationing Spaniards, in recent years the Costa de la Luz has become more popular with foreign visitors, especially the French and the Germans. Increasing urbanization and tourism-oriented development of parts of the coast have had economic benefits, but these trends have also ignited fevered real-estate speculations and some environmental degradation.